Your computer hard disk is one of its most important components. It is in constant use whenever the machine is running and it is home to not only Windows, but also all of your important files. As such, it is good idea to do what you can to keep an eye on it to help ensure that nothing is going to go wrong. 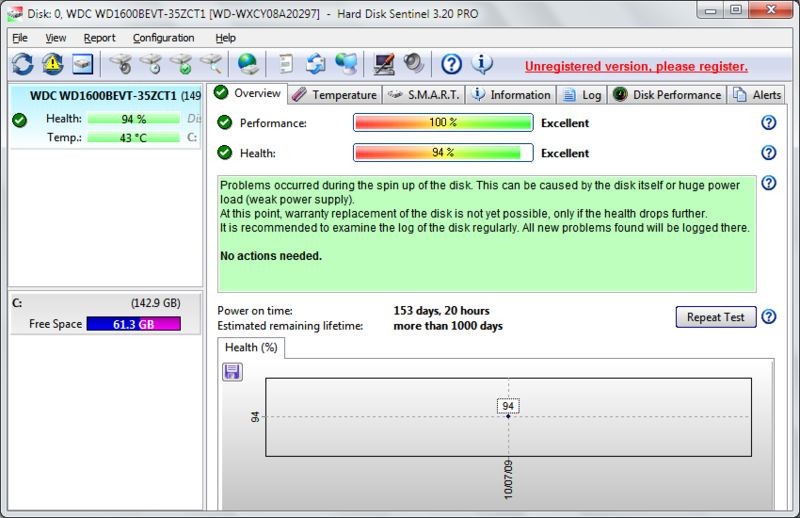 This is what Hard Disk Sentinel enables you to do, proving reports, statistics and tips about your drives. Whether you have a single hard drives installed, a number of internal drives or a combination of internal and external drives, the program can keep you informed about the state of all of them. Hard Disk Sentinel will monitor the temperature and health of your drives, making use of SMART information to provide detailed feedback about what is going on with your disks. The program can also provide you with all manner of detailed specifications about your drives including spin up times and Seek Error Rate. Warnings will be displayed if your drive's temperature becomes too high or the overall health level starts to suffer. You can perform a variety of tests such as surface tests to check the integrity of your disks so you can pre-empt any problems that may arise. A comprehensive informational and diagnostic tool for hard drives. The tests are thorough and the amount of data provided is impressive. Not exactly freeware. It installs as a non registered version.